YouTube just launched a new feature that will help video uploaders get more Twitter followers. Basically, when someone tweets your video using our “Share to Twitter” functionality, we’ll suggest they follow your twitter account on the confirmation screen. How can you make this work for you? 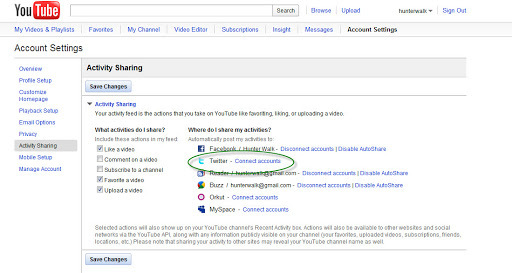 You need to connect your Twitter account to your YouTube account in the Account Settings (see screenshot below). Note: also see the settings here to opt-in or out of Tweeting your uploads, likes, favorites, etc. ← Flick me? No, flick you!